‘Welcome to Malawi, the Warm Heart of Africa!” announces the poster at Kamuzu Airport. It’s reminding new arrivals that this small, landlocked East African country is Ebola-free and dedicated to the protection of its wildlife with zero tolerance for poachers, ivory and exotic species smugglers. Beside it, trees draped with cascades of vibrant yellow flowers fringe the arrivals area. A red carpet is rolled out. Then I experience another first – a great big smile and a verbal welcome from an immigration official. There’s no red carpet a few days later, however. By then, I’m uneasily gripping the sides of a timber boat with a sluggish outboard motor. A crocodile of similar size slithers off a nearby river bank. Circling ripples ahead are created by hippos, coming up for air near Kapachira Falls in the magnificent Majete wildlife reserve. In 1859, Dr Livingstone (“I presume”) was forced to abandon his historic journey up the Shire River at this very spot due to strong rapids. Malawi is one and a half times the size of Ireland, squeezed between Zambia, Tanzania and Mozambique. While Jeeps pile through popular safari parks in Kenya and South Africa, this has somehow remained an unspoiled pocket where wilderness parks and game reserves – decimated in the past by poaching – are thriving again. 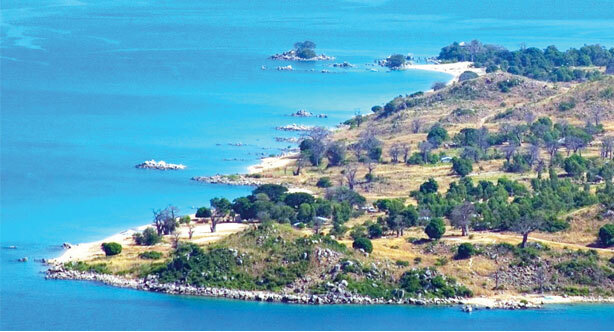 Lake Malawi, the world’s third-largest and Africa’s most beautiful, is home to hundreds of species of tropical Cichlids. Snorkelling among these magical fish on the Rift Valley lake floor is a glorious experience. Add dramatic mountain landscapes and wildlife encounters far removed from mass-safari tourism, and Malawi is a magical road less travelled. Of course, given the Ebola crisis and sporadic terrorist attacks in Kenya, first-time travellers may be nervous or wary about visiting sub-Saharan Africa. In reality, however, Ebola-affected areas are as far away from East Africa as London, while conflict zones can be thousands of miles removed from the places tourists go. In new Lilongwe (the capital is divided into ‘new’ and ‘old’ towns), pristine roads are lined with large villas behind even larger fences. High-rise offices and a new shopping centre predominate. The chaotic old town is another story. Here, limos ferrying diplomats and foreign delegations are replaced by battered minibuses. This form of public transport doubles as an economic lifeline for small farmers and traders ferrying produce about. In the labyrinthine City Market, women wearing jazzy Chitenjes (cloth wrapped from waist to ankle) squat barefoot behind pyramids of fruit and vegetables. I’m at the centre of the market when a scrum surges forward, with punters bidding for coveted lake fish – fresh, dried and salted – in dripping sacks and crates. As the only woman and foreign face in a milling male crowd, I expect to be pushed and stared at. Instead the men smile and shout out greetings like “Hullo Missie, welcome!” One gentleman even steadies me as I slip over a pile of fish entrails. Heading south on the M1, the main road to the Mozambique border, traffic is routinely stopped by police searching for smuggled people, illegal bush meat, ivory, animal skins, guns and drugs. Fields of maze and huddles of mud-walled grass huts, many wretchedly poor, are dotted around. On a hairpin bend, an old man wobbles on a bicycle piled with sacks of charcoal. Minutes later, a small boy darts out to chase a runaway goat. On the shores of Lake Malawi, I join a RIB (rigid inflatable boat) just in time to catch a fabulous sunset on thickly-forested Nankoma Island, deserted except for the romantic Blue Zebra Island Lodge (bluezebra. mw) – famed for bird watching in this UNESCO WorldHeritage-protected Marine Park. Dining under the stars after a couple of strong sundowners, I taste delicious steamed Chambo from the lake wrapped in a banana leaf. There is no sign of another Malawi speciality Nkhululu (oversized grasshoppers), but nobody seems to mind. My next stop, Game Haven Lodge and Mbawa Country Club (gamehaven.mw), is set in 500-acre private Chimwenya Game Park – not far from the second city of Blantyre, named after David Livingstone’s birthplace in Scotland. Nyala, waterbuck, impala, eland and occasionally giraffe wander across the golf course greens. A zebra seems reluctant to leave the fifth hole, to the chagrin of approaching players. On the nearby Satemwa tea plantation estate is Huntingdon House (huntingdon-malawi.com) – a relic of colonial days. Once a family home, it is now an elegant boutique hotel with terrific food, set among manicured lawns, blue gum trees and formal gardens.